How faculty use and regulate student use of technology in the classroom is a growing concern across university campuses. In the fall of 2017, PLNU invited Jean Twenge, author of the book iGen: Why Today's Super-Connected Kids Are Growing Up Less Rebellious, More Tolerant, Less Happy - and Completely Unprepared for Adulthood - and What That Means for the Rest of Us, to come speak to our faculty and staff. 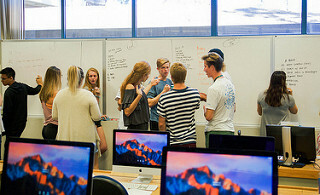 As a result, PLNU has developed an on-going conversation among faculty who are open to discuss best policies or principled practices for student tech use in the classroom. Below are sample policies from faculty syllabi, articles, and other resources from which to draw. Several PLNU faculty have tech policies written into in their syllabi. The following page collects some of these ideas that may be helpful to you as you consider ways to include tech policies in your classroom. Are you interested in what the research says about student use of technology in the classroom and how this affects their learning? The following page links to a number of these articles. Learn where and how to build your resources on understanding the current generation of students in our classrooms.